Tonight, NASA will send a spacecraft on a seven-year long journey to bring us back some dirt from an asteroid—without ever even landing on it. Watch along with us as it launches at 7:05 pm EDT. In 2023, the dirt the OSIRIS-REx mission scoops up from nearby asteroid Bennu will return to Earth in a special release capsule containing the largest amount of off-world samples NASA has received since the Apollo missions. Researchers are hoping that analyzing those samples could reveal that the source that originally got life brewing on our own planet could have come from asteroids like Bennu. Before the researchers can get to those samples, though, the spacecraft will first undergo a harrowing journey. That journey will include several passes around the asteroid as the spacecraft conducts a 2-year-long mapping mission and a particularly difficult maneuver in which a 10-foot robotic arm will grab a dirt sample from above the asteroid. 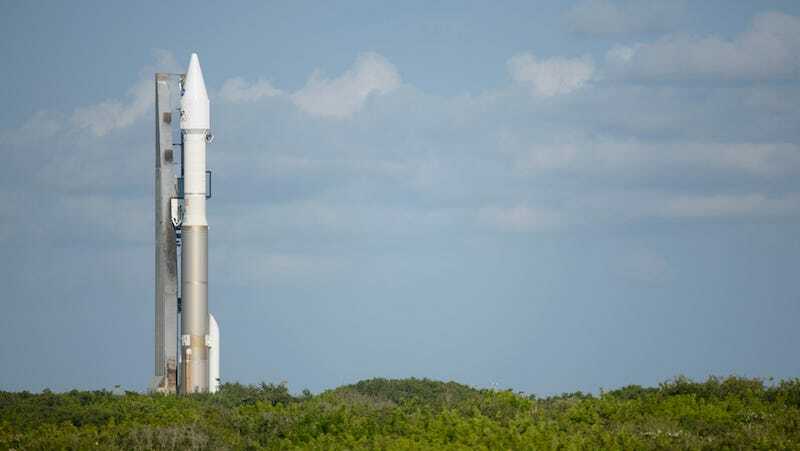 The OSIRIS-REx mission will be launched atop one of United Launch Alliance’s powerful Atlas V series rockets—the same rocket series responsible for sending up both New Horizons and Juno—in its thirteenth major mission flight for NASA. The launch will take place from Florida’s Cape Canaveral station in a 2-hour window between 7:05 - 9:05 pm tonight. You can watch the whole thing happen live with us right here.